“Hello my name is Amanda and I am the florist who will be looking after you for your Winter elopement wedding. So, excitingly you have chosen the most wonderful garden venue for your compact and bijou elopement wedding, but I want to say that because your event is small it does not mean that your choices have to be. The package includes a bouquet and buttonhole, but not just any bouquet and buttonhole, it is my mission to create something you always dreamed of. You only need to share with me what you have set your heart on – and it is my mission to create it for you. Planning the flowers is like a series of lists, which include: Colours, shapes of bouquets, i.e. round, wild, trailing, over the arm etc. Flowers that you love which are seasonal, (although I can help you with these), also a list of adjectives really helps with the style of the flowers e.g. wild, rustic, elegant, hip, boho, formal, informal etc. As a qualified British Master Florist, I am able to re-create any style, be it, natural garden style, contemporary, themed i.e. 1920’s, Alice in Wonderland, or all one colour, tropical, French, (really the opportunities are endless), so I urge you to make the most of me. 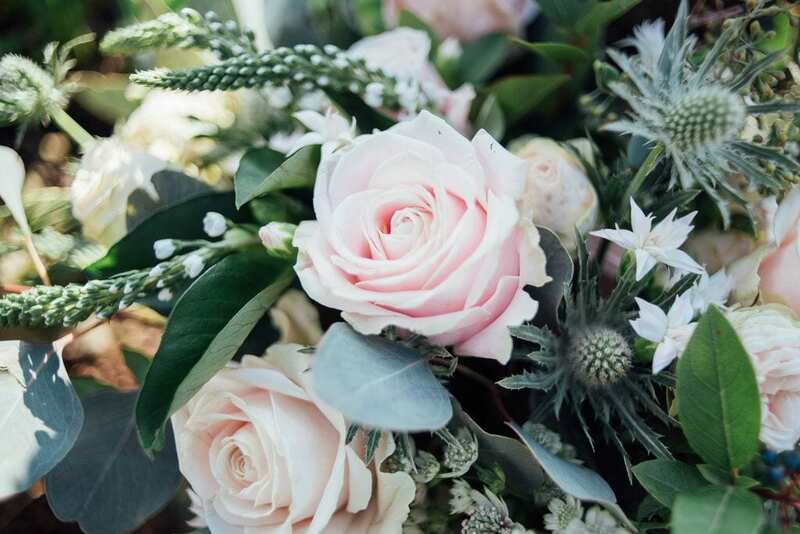 Once you have an idea of what you would like, then all you need do is send me an email with any pictures of bouquets you have seen that you really like, together with the details of your outfits. It is also important to say that you have other choices too, should you want extra flowers, nothing is too much trouble, for other members of your family/guests, table arrangements, an arch and for dressing the cake then just drop me a line, the sky really is the limit. Finally, I deliver the flowers direct to you on the morning of your wedding, usually around 11am, and it is both scary and wonderful to hand you your bouquet and see the joy it brings, and it makes my heart sing to see you hold it in your wedding photos. I can’t wait to create something truly romantic and beautiful for you. As you’ll see from the gallery of Amanda’s Ever After elopement bouquets below, each one is made specially for you so each one is completely unique. Which one is your favourite?